This article is about the year 1832. 1832 (MDCCCXXXII) was a leap year starting on Sunday of the Gregorian calendar and a leap year starting on Friday of the Julian calendar, the 1832nd year of the Common Era (CE) and Anno Domini (AD) designations, the 832nd year of the 2nd millennium, the 32nd year of the 19th century, and the 3rd year of the 1830s decade. As of the start of 1832, the Gregorian calendar was 12 days ahead of the Julian calendar, which remained in localized use until 1923. Wikimedia Commons has media related to 1832. January 6 – Abolitionist William Lloyd Garrison founds the New-England Anti-Slavery Society. February 9 – The Florida Legislative Council grants a city charter for Jacksonville, Florida. Ecuador annexes the Galápagos Islands. A cholera epidemic in London claims at least 3,000 lives; the contagion spreads to France and North America later that same year. March 24 – In Hiram, Ohio, a group of men beat, tar and feather Mormon leader Joseph Smith. April 6 – United States: The Black Hawk War begins. May 7 – The Treaty of London creates an independent Kingdom of Greece. Otto of Wittelsbach, Prince of Bavaria, is chosen King; thus begins the history of modern Greece. May 11 – Greece is recognized as a sovereign nation; the Treaty of Constantinople ends the Greek War of Independence in July. May 10 – The Egyptians, aided by Maronites, seize Acre from the Ottoman Empire after a 7-month siege. May 24 – Francois Arban, early French balloonist, makes his first ascent. Germany: The Hambacher Fest, a demonstration for civil liberties and national unity, ends with no result. Canada: The Rideau Canal in eastern Ontario is opened. June 5–6 – France: The June Rebellion, anti-monarchist riots led chiefly by students, breaks out in Paris. June 7 – The Reform Act becomes law in the United Kingdom. June 9 – The Strasburg Rail Road was incorporated by the Pennsylvania State Legislature. Today, it continues as the oldest continuously operating railroad in the Western Hemisphere. July 2 – André-Michel Guerry presents his Essay on moral statistics of France to the French Academy of Sciences, a significant step in the founding of empirical social science. 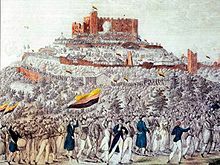 July 4 – Durham University is founded in the north of England, by an act of Parliament given royal assent by King William IV. July 9 – The Commissioner of Indian Affairs post is created, within the United States Department of War. July 10 – The United States Survey of the Coast is revived, within the Department of the Treasury. August 2 – The Bad Axe Massacre ends the last major Native American rebellion east of the Mississippi, in the United States. August 7 – William Howley, Archbishop of Canterbury, has his coach attacked by an angry mob on his first official visit to Canterbury, because of his opposition to the Reform Act in the United Kingdom. August 17 – China ceases production of iron shuriken. August 27 – Black Hawk (Sauk leader) surrenders to the United States authorities, ending the Black Hawk War. November 14 – Charles Carroll, the last surviving signer of the Declaration of Independence dies at his home in Maryland at age 95. November 21 – Wabash College, a small, private, liberal arts college for men, is founded. November 24 – Nullification Crisis: The U.S. state of South Carolina passes the Ordinance of Nullification, challenging the power of the U.S. federal government, by declaring that it will not enforce national tariffs signed into law in 1828 and 1832. December 3 – U.S. presidential election, 1832: Andrew Jackson is re-elected president. December 4 – Battle of Antwerp: The last remaining Dutch stronghold, Antwerp Citadel, comes under French attack. December 21 – Battle of Konya: The Egyptians defeat the main Ottoman army in central Anatolia. December 23 – The Siege of Antwerp ends, with the Dutch garrison losing the citadel. December 28 – John C. Calhoun becomes the first Vice President of the United States to resign. George Catlin starts to live among the Sioux in the Dakota Territory. The first Baedeker guidebook, Voyage du Rhin de Mayence à Cologne, is published in Koblenz. Publication begins (posthumously) of Carl von Clausewitz's Vom Kriege ("On War"). The City of Buffalo in New York is incorporated. The Cumberland and Oxford Canal connects the largest lakes of southern Maine with the seaport of Portland, Maine. ^ Recks, Robert. "Who's Who of Ballooning". Retrieved 24 May 2012. ^ Ward, Ernest E. (1967). My First Sixty Years in Harrison, Maine. Cardinal Printing. p. 7.